It’s not every year a town turns 100, so Nobleford is pulling out all the stops to celebrate. Taking place of their annual Nobleford Heritage Day celebration, Nobleford is having its Centennial Celebration on Aug. 10-12. This will also be the first summer event that Nobleford is celebrating as a town, as the former village achieved town status last February. Celebrations start on Friday, Aug. 10, with an outdoor Farmer’s Market from 4-9 p.m. Self-guided Historical Community Tours will be taking place throughout the day, and special golf rates are being offered at the Keho Park Golf Course. The Nobleford Area Museum will be open from 10 a.m.-4 p.m., with viewings of the short film ‘A Noble Vision’. A Beer Garden and burger and hotdog BBQ will go at the community complex in the evening, and Family Night in Centennial Park — complete with games entertainment, a movie and a Legacy Lane dedication at 8 p.m. — will take place. Saturday, Aug. 11 will kick off with a free pancake breakfast at the community complex from 7-10 a.m., followed by coffee at the Senior’s Centre from 9:30-11 a.m. The parade will kick off at 11 a.m., followed by a Show and Shine on Railway Avenue, Quilt Show and Fine Arts Display and guided tours at the modernized Noble Central School, BBQ lunch at the Nobleford Fire Department and pony rides, a Bench Show, family activities and a Scent-hurdle Demonstration (dogs) will take place in the afternoon. A Centennial Dinner will take place at the Community Complex, for attendees with pre-purchased tickets, followed by a commemorative program with evening entertainment. A street dance will go from 7-10 at King Street/Centennial Park with fire-pits and s’mores, followed by a firework display at 11 p.m. at the complex’s soccer fields. Sunday, Aug. 12, will see the festivities wrap up with a Scabby Butte Hiking Tour at 9 a.m., with participants meeting at the museum at 8:45 a.m., and a 2 p.m. Community Church Service at the Community Complex. While the official 100th Birthday for the town was on Feb. 28, it can be hard to hold a full celebration while people’s teeth are chattering from the cold, so while a birthday party for the town was held on the actual date, further festivities were planned for summer in conjunction with their annual summer event. “Basically, we’re throwing a big party to celebrate 100 years as an incorporated community. 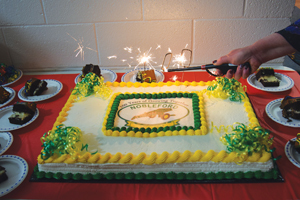 We were incorporated as a village in 1918, and on our official date of incorporation in February, we were granted town status as well, so now we’re have big celebrations in conjunction with our normal celebrations that we hold in the summer for the community,” said Lee Moltzahn, president of the Nobleford Centennial Society.